À une époque où la quête de sensations fortes se fait parfois au détriment du reste, il est bien de noter que «The Rite» n'abuse pas trop des effets chocs gratuits. Non pas que l’exercice soit désappointant de bout en bout. Mais vous obtenez un assez bon exemple de la façon dont le personnage d’Hannibal Lecter, campé par Anthony Hopkins, peut être recyclé, le vétéran acteur jouant le dernier acte du film comme s’il était à nouveau le sanglant psychiatre du long métrage Le Silence des agneaux et ses autres volets. Hafstrom, who also made the 2005 thriller Derailed, with Clive Owen and Jennifer Aniston, is a master of pacing, and while the film runs a full two hours, the slow build never feels like a drag. Difficile de croire à ce festival de clichés et, surtout, à ce scénario prévisible enrobé de prétentions métaphysiques et théologiques. You need a character that doesn’t believe, just as you need one that’s blindly assured. You need fake scares and real scares and a creepiness that builds until some conflict-resolving final act. The Rite has all that, as well as one very good acting performance, but just as it builds into something truly powerful, it completely undercuts itself by introducing a largely irrelevant side character and asking another to behave totally against personality. For the love of Beelzebub, this could have been one of the all time greats. Instead, it’s just a missed opportunity. But the slick premise; spine-chilling imagery, thought provoking subject matter and Anthony Hopkins blowing everyone and everything off the screen via his grandiose showcase made it time well spent. It has satisfying moments, but the movie is so slowed by talk, unnecessary characters and some odd symbolism (including a possessed donkey) that the battle for souls seems to be lacking a little heart. There's nothing wrong with The Rite that spinning heads and a little pea soup wouldn't cure. Hopkins speaks a fair amount of workmanlike, subtitled Italian in "The Rite", and he seems more focused and engaged for this assignment (after looking lost in "You Will Meet a Tall Dark Stranger"). 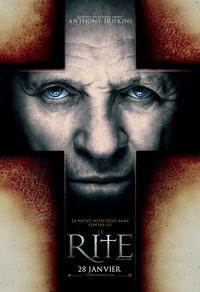 Lenser Ben Davis gives "The Rite" a chilly, clammy look that aptly enhances the impression that, at any moment, Kovak is going to learn another harsh lesson about dealing with the devil. Other tech values are similarly first-rate. Without head spinning and bilious regurgitation, “The Rite” is a workmanlike B-movie that embraces as many of the genre’s clichés as a PG-13-rating allows.